their possible target. 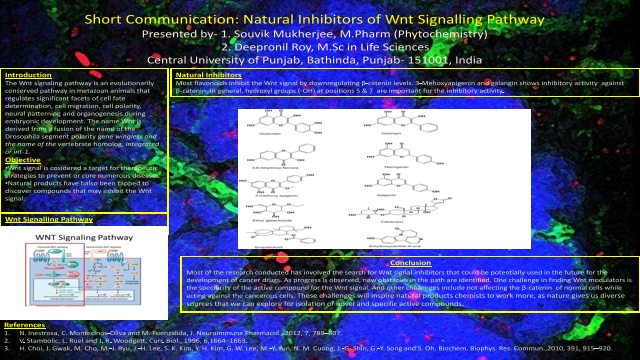 Summary: In this poster, we tried to depict the future therapeutic uses of naturally derived chemical compounds that can regulate one of the most important cell communication pathways, i.e., Wnt signaling pathway. References: 1. N. Inestrosa, C. Montecinos-Oliva and M. Fuenzalida, J. Neuroimmune Pharmacol., 2012, 7, 788–807. 2. V. Stambolic, L. Ruel and J. R. Woodgett, Curr. Biol., 1996, 6,1664–1669. 3. H. Choi, J. Gwak, M. Cho, M.-J. Ryu, J.-H. Lee, S. K. Kim, Y. H. Kim, G. W. Lee, M.-Y. Yun, N. M. Cuong, J.-G. Shin, G.-Y. Song and S. Oh, Biochem. Biophys. Res. Commun.,2010, 391, 915–920.